Stout Adventures’ climbing team, known and feared as the Menom-Bombs, will attempt to win the Wisconsin Indoor Climbing Series team championship for the fourth consecutive year, all while wearing Alice in Wonderland inspired attire. On Saturday March 7, the Menom-Bombs will continue their campaign for first place at the 14th annual RockFest, held at and hosted by Stout Adventures. The Menom-Bombs have taken home The Rock—the official WICS first place trophy—ever since WICS was founded in 2011. They’re undefeated. If you walk into Stout Adventures you can see championship banners and The Rock proudly displayed. Just don’t try to pick it up; it’s really heavy. Designed and created by a University of Wisconsin–Stout student, Stout has always been it’s home. The Menom-Bombs aim to keep it that way. The Menom-Bombs are a varied group; there are people of all ages and from all kinds of climbing experience backgrounds. They are in all kinds of majors as well, ranging from the environmental backgrounds that you may expect, to social science and industrial design majors. “Everyone does something different,” said Evan Stickles, a veteran Menom-Bomb. “That’s the cool thing; it’s a big melting pot of different personalities.” They are a self made team too; they don’t have an official schedule or a coach, instead everyone accounts for one another. It’s truly a student-run team. WICS was started to enhance the climbing community in Wisconsin. It has six competitions held at UW campuses from as far north as Superior to as far east as Oshkosh. Three events are already complete, coincidentally at Oshkosh, Superior and Stevens Point. RockFest will be the fourth event in the series this year. The Menom-Bombs have made a good showing, coming in a close second behind competitor Stevens Point. “This year is a great year because we have been confronted with some good competition,” said Stickles. “As much as it is a competition, at the end of the day we all know each other, and we’ve been doing this for the past four years and longer.” It’s clear that the event will be great fun no matter who wins. 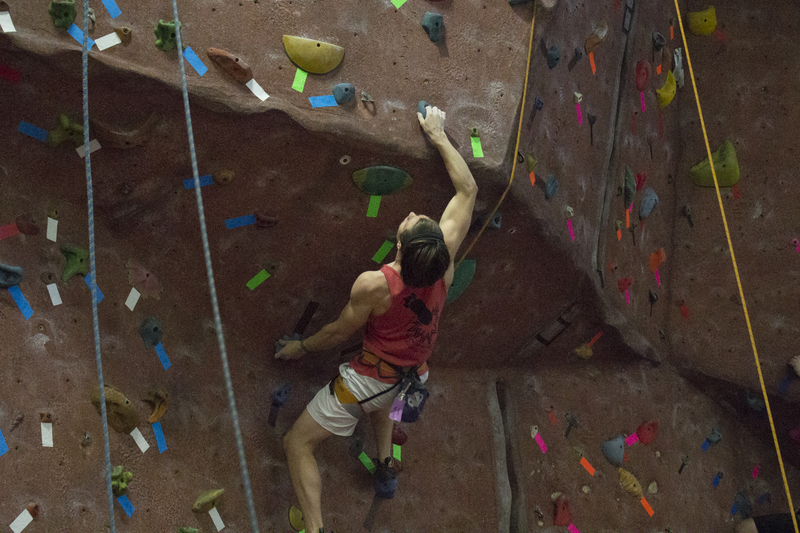 RockFest is no small event; last year there were over eighty climbers at our climbing wall in the Fitness Center. It takes the fifteen student staff a whole week to clean the holds, change the tape, make new routes, and test the new routes. Once Rockfest is actually here, it will last the whole day. Starting at 9 a.m., climbers will register for the preliminary rounds and eventually hope to make it to the finals at 4:30 p.m. At 5:45 the finalists will be scored, and awards and prizes will be handed out to the winners. After that there will be a free screening of the rock-climbing documentary Reel Rock 9 in Applied Arts 210 and a presentation by pro climbers Meagan Martin and Courtney Woods. As if all that wasn’t fun enough, the Menom-Bombs have costumes. Every year the Menomonie event has a theme, and this year it is Climbing in Wonderland. Other themes have been That 70s Climbing Competition, Stout Adventures and the Climbing Factory and First Ascent, which allowed the first flasher to name the route. No, not the kind of flashing you’re thinking; flashing is completing a climbing route without ever having seen it or practiced it before. Not only the best climbers, but also the best-dressed can win climbing gear and other great prizes from one of the many awesome WICS sponsors. More than just RockFest, Stout Adventures offers a huge variety of awesome opportunities. There are all kinds of trips to go on, outdoor equipment to rent, and, of course, rock climbing. There are even free training clinics, new this year. If you want to get involved, just go to Stout Adventures in the Sports and Fitness Center to see what they have to offer. You can also follow the Menom-Bombs on their path to victory by liking their Facebook page at Menom-Bombs Climbing Team.